About those bioplastic bags - you know, the ones you've been using to assuage your eco-conscious guilt - turns out not only are they not as green as you think, they could also be partially responsible for the global food crisis. 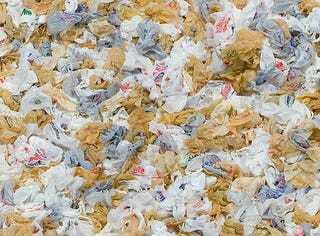 A worldwide effort by bag-heavy industries to replace petroleum-based plastics with plant-based plastics could actually lead to more environmental problems, according to a study by the Guardian UK. The bags, made from sugarcane, corn or wheat, can increase greenhouse gas emissions because they require higher temperatures to decompose. Even the biodegradable versions don't disintegrate as planned when thrown into the anaerobic environment of a landfill. The lack of oxygen causes the bags to release methane, which is 23 times more powerful than carbon dioxide. They also tend to screw up recycling operations by contaminating the waste stream and making regular recycled plastics unsaleable. Recycling companies would need to invest in extremely expensive equipment to extract bioplastic packaging from regular waste.